I attended the Affecto Corporate IQ 2011 event this morning, in Oslo, Norway, in the Thon Hotel overlooking the spectacular Opera House. The theme of the conference was “Revolution”, and was kicked off by Håvard Ellefsen, the CEO of Affecto in Norway. I gave the opening keynote, on the “Big Leap Forward”. As usual here are the slides for download, in Microsoft PowerPoint and Adobe Acrobat format. 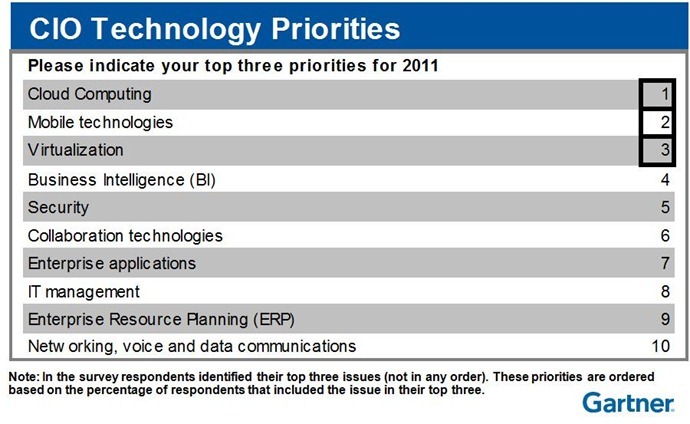 BI ranking in priorities for the Nordic countries: #4, after cloud computing, mobile technologies, and virtualization. Over time, people are moving from “systems of record” to “systems of differentiation” to “systems of innovation” – and you need all three. 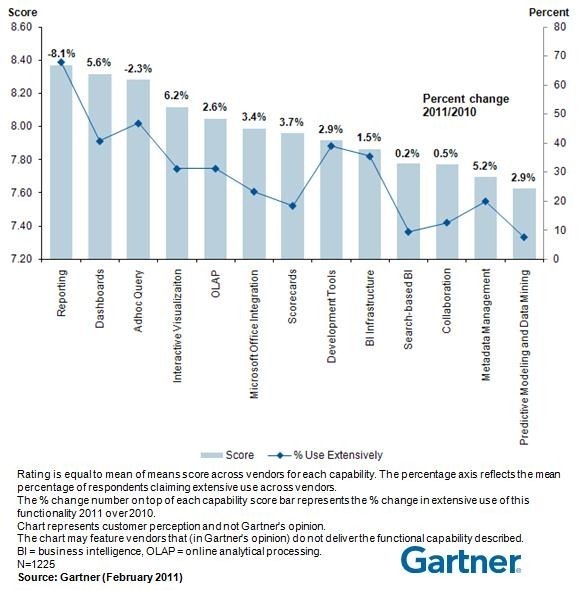 And these vendors benefit from the trend towards standardization — 76% of SAP customers it to be their BI standard – higher than Oracle at 75% and IBM at 72%. Second big trend is the shift towards business-focused buying, and the rise of “data discovery” solutions, and a shift away from reporting, to dashboards, etc. 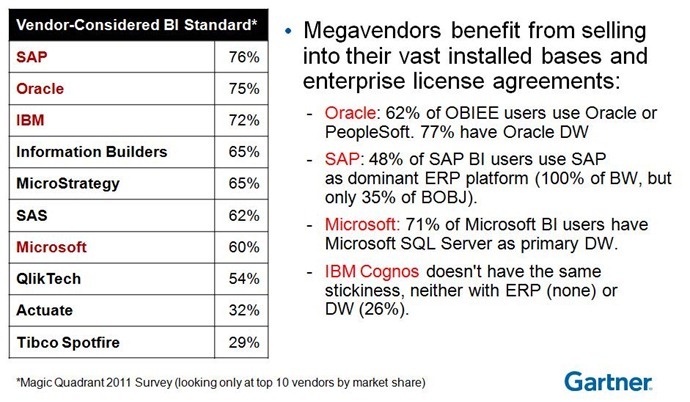 Megavendors will own 75% of BI platform market share, from two-thirds today. 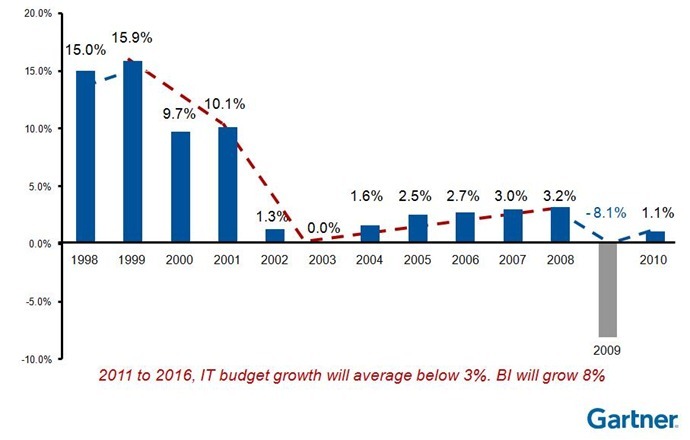 Use of BI/analytics/PM will have doubled. Cloud BI – lots of hype, but a small footprint today. New social BI provides a step towards “Decision Support 2.0”. 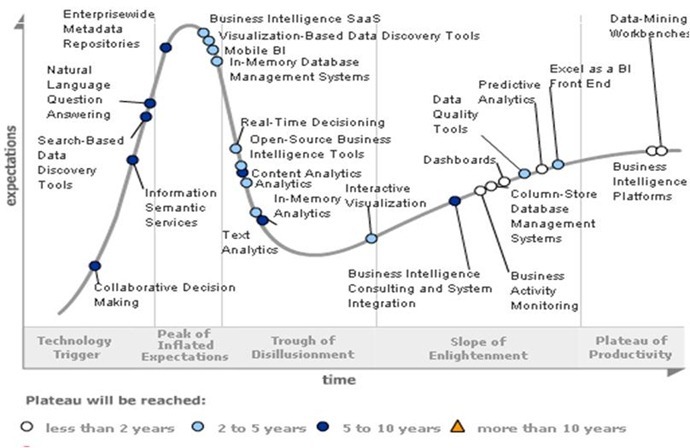 Mobile: “By 2013, 33% of BI functionality will be consumed via handheld devices”. There was a panel session with myself, Dan Sommer, Jonas Lie-Nielsen of the Norwegian Post, Anita Steine of Canal Digital and Eldar Sveinung of Mills. 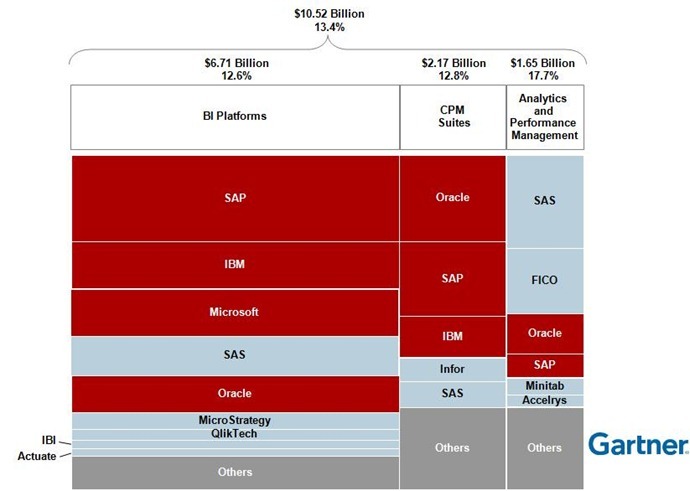 What’s the single most important issue that should guide your BI investment? Why? I said something along the lines of “investment in people is the biggest opportunity in BI”. When BI projects fail, it’s because of people, process, and culture – not technology. So are you spending 90% of your time on those issues? Dan mentioned that it was simply imperative to invest in BI to avoid the fate of companies like Blockbuster. What’s the biggest shift that will change the business? I cited the new opportunities brought by in-memory, column stores, etc, to provide information more flexibly. 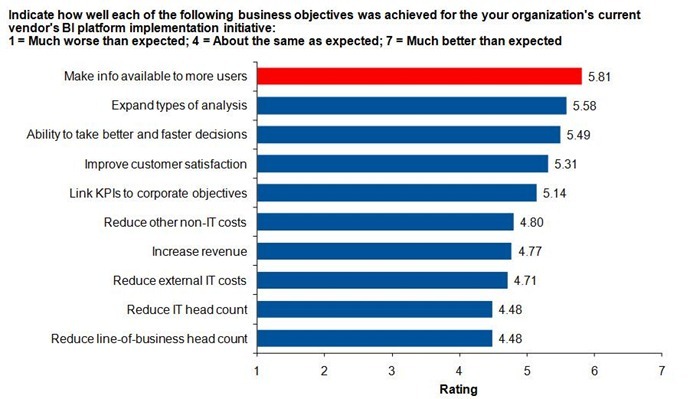 Why do we want CEO attention in BI decisions? Isn’t this a tech matter after all? Ease of Use vs functionality. My take: one thing you can do right now is roll out a simplified version of your current environment, to ALL your users. You can never overestimate the sophistication of your business people’s needs. Follow in Apple’s footsteps by saying “no” to new functionality until it’s been widely adopted. What Can We Learn From Neanderthals?